2017 proved to be a breakout year for modern day wellness. The ‘take charge of your health’ flag was hoisted across social and mainstream media alike. This mantra signaled a surge in interest for wellness knowledge and techniques among an ever-widening demographic. This new era of health and wellness witnessed in 2017 shall continue to evolve in 2018. Wellness in 2017 was no longer considered a hobby but a way of life and a means by which to help people successfully navigate the ever complicated and sometimes chaotic global situations we find ourselves in. The trends we will likely see evolving in 2018 will further support the idea of taking a holistic approach to your health. There will be a focus on furthering scientific proof of natural health strategies with specific techniques to be chosen by the individual based on preferences and other diagnostic information. DNA testing kits such as EverlyWell will be far more comprehensive and affordable in 2018 as the race is on for market share in this hot space. You can get personalized information on everything from effects of your dietary habits, microbiome makeup and functionality, to hormonal levels and imbalances as well as your genetic predisposition for certain diseases. Some of the most ground breaking trends in wellness continue to be in the technology sector and its convergence with healthcare. Tracking, monitoring and using accumulated health data will begin to move into a more preventative and predictive role. Procedures and diagnoses will be more aided by equipment that has significantly smaller margins for error than humans. Data collected on your health through the use of various tracking devices will not only improve your wellness strategy but can also be invaluable to doctors in case of an emergency. Expect to see more scientific studies giving us proof that our favorite alternative medicine therapies and techniques really work (as if we didn’t already know!). This will also help to separate the potential for blatant marketing hype of unproven methods. So it’s a very good thing. This is not in and of itself a new trend but the reasons why people are opting for vegan diets is expanding from health and ethical reasons to environmental ones. It has been proven that the amount of animals we slaughter for our carniverous food supply has a direct effect on climate change. Living more sustainably to help slow down the ill-effects humans have on the environment is a very hot button going into 2018. So look for gigantic strides in the availability and quality of meat substitutes in the future. Have you had an all-veggie burger? They’re amazing! Body energetics, exuding positive vibrations and the connection between mind, body and the energy of the spirit continues to be at the forefront of wellness gurus and practitioners of all levels in 2018. One such technique that will capture the attention of many more seekers this year is the magic of chakra balancing. These energy centers located throughout the body are connected to all aspects of being and by clearing, tuning and balancing them you feel a greater sense of wholeness. If you don’t have much experience with this concept start by taking a class or online tutorial or work with a practitioner in your local area. You can take it a step further and purchase your own chakra balancing crystal set and practice regularly. 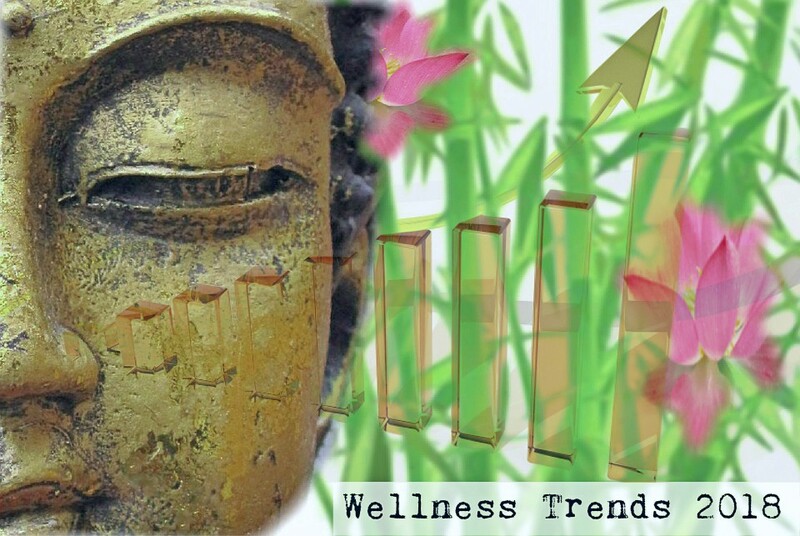 Last year receiving energy healing was a major trend according to Pinterest, that is poised to continue this year. However, as so often happens when you work with an energy healer you want to learn it for yourself. By learning the reiki techniques you increase the amount of Chi or Lifeforce energy you can hold within your body empowering you to share that energy with others for healing. You can also use reiki on the food and water/tea/elixirs you ingest to send the healing energy through your digestive system and bloodstream. Although far from a new concept we are seeing more significance being placed on celestial events and the wisdom they bring as people paid more attention to eclipses, moon phases and other astrological signals in 2017. 2018 will see even greater understanding of how our Earth’s position in the cosmos influences aspects of our mind, body and spiritual wellness. Look for 2018 to be a year of scientific and technological advancements in wellness that will serve to capture the approval of former skeptics. Our health approaches will become more deeply ingrained in our day to day routines as a way to navigate life more successfully. We will look more often to the moon and the stars for answers that help our mental and emotional well-being.